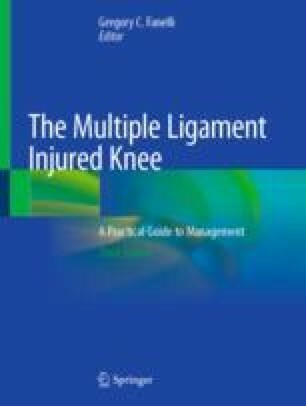 Multiple ligament knee injuries, although rare, are severe injuries because they result in the loss of the passive and active knee stabilizers as well as often being associated with the compromise of neurovascular structures. Treatment of these injuries is controversial, and results after surgery can sometimes be poor. After sustaining injuries to multiple ligaments, the knee is at a biomechanical disadvantage which poses a reconstructive and rehabilitative challenge to even the most experienced orthopedic surgeon. Surgeons performing reconstructions in patients with these injuries must have a complete understanding of the normal anatomy and biomechanics of the knee to optimize the timing of surgery, surgical approach, tunnel preparation, and the anatomic placement of grafts. This chapter outlines the anatomy and biomechanics of the cruciate ligaments and their surgical implications. The structure and form of the anterior and posterior cruciate ligaments, patterns of injury, structural properties of the cruciate ligaments and graft substitutes, functional biomechanics and interplay between the cruciate ligaments, and the surgical implications related to anatomic reconstruction of the anterior and posterior cruciate ligaments are all reviewed in detail.